August 2011, Machine Control System "PHS-360" was released to. January 2011, green laser rotation "GSL-VH10" was released to. January 2011, waterproof digital Walking Measure "DWM-190P" was released to. November 2010, a full-line detector electron laser leveling formula "EXA-YR44" was released to. June 2010, an industrial endoscope with LCD monitor "IES Series" was released to. 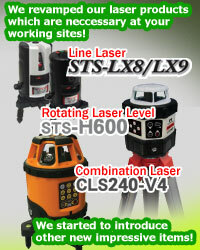 June 2010, Line Laser "EXA Series" was released to.